Recent social media postings have started to advertise, that an employee of Mark Ruffalo’s WATER DEFENSE considers whole house filtration systems an important health protection for Flint Residents. The postings cite WATER DEFENSE sampling data and assert that the NLP™ brand filtration systems produce “the cleanest safest water in Flint.” The sources also state that WATER DEFENSE chief “scientist” Scott Smith, asserted in writing, that only NLP™ brand filters produce water that is “safe for […] showering and bathing” in Flint. This remarkable conclusion seems to be based on Mr. Smith’s 16 months of work collecting mountains of flawed data from homes of Flint residents—he has no apparent expertise in evaluating potable water safety or rating the performance of water filtration/conditioning devices. 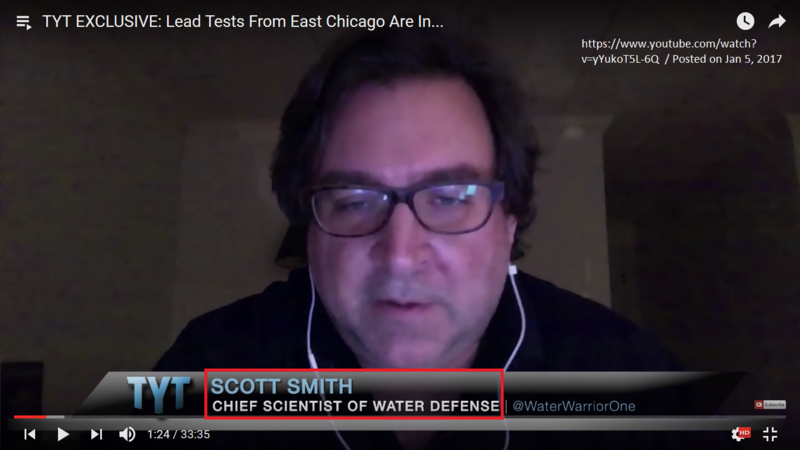 Mr. Smith’s (Chief Scientist of non-profit WATER DEFENSE and also active in Flint as a representative of his company Aquaflex Holdings LLC) misguided efforts during the Flint Water Crisis have been well-documented. First, it was revealed he made royalties from the flawed WATERBUG™ sponge sampling technology. It was then revealed Mr. Smith had launched a private side business soon after he came to Flint, that would attempt to sell Aquaflex™ filters to fix water quality problems revealed by WATER DEFENSE sampling. We thought both of these efforts were ended after they were revealed by FLINTWATERSTUDY and others, but we just discovered Smith’s AquaFlex Holdings LLC is involved in Flint. The latest effort promoting junk science conditioners at NLP™, which includes a “package deal” with a proposed $2100 payment to Mr. Smith out of a total cost of $11,300-$13,800 per Flint house, represents a perfectly logical progression in Mr. Smith’s self-promotional efforts to exploit the Flint Water Crisis. Note: Water Defense lawyers, have since stated in writing that Mr. Smith’s letter endorsing the NLP™ filters, was not from Water Defense. Herein, we provide a few notes of caution for Flint residents, who might actually seriously consider Mr. Smith’s support for NLP™ brand products in order to protect their families health. But that is not all. Extraordinary health related claims are made regarding the properties of the water treated by the NLP™ conditioner. Specifically, if water from this device is put on plants, growth of the root system is remarkably enhanced! The social media postings also report that if cows drink NLP™ conditioned water, they give 30% higher milk production. It is left to the imagination as to the wondrous health benefits of this water for humans. Passing water through an NLP™ water conditioner supposedly has wondrous effects. When we look at the science behind the conditioner, there are no peer reviewed scientific publications backing up the performance claims or the principles by which it supposedly operates. The explanations that the company provides makes no sense at all. 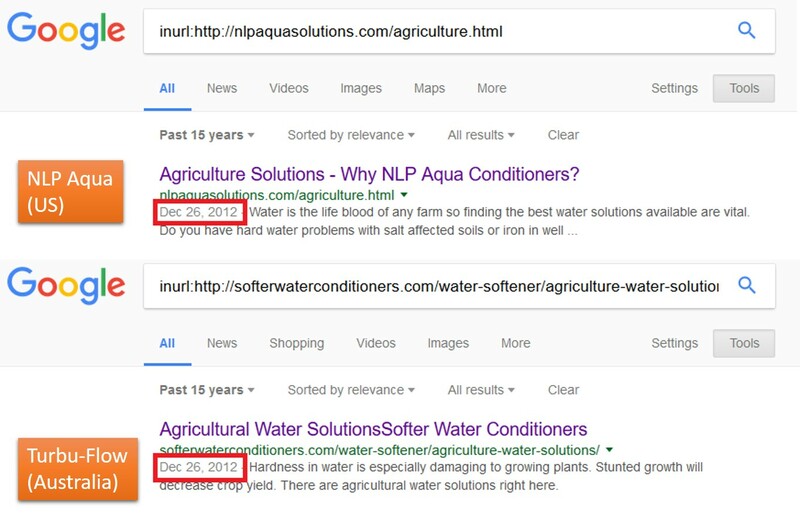 If something sounds too good to be true, it probably is, and in this case the NLP conditioners have been identified by some as “junk science” water treatment (Note: NLP™ appears to be identical to a product marketed as “Turbu-Flow” in Australia based on identical web pages). Following the NLP™ water conditioner that seems too good to be true, the NLP™ filtration system includes normal whole house water filters and then a point-of-use filter. These NLP products are indeed rated for removal of several contaminants by a credible organization– just like many other competing water filtration systems available in the marketplace. However, claims are being made that the NLP filters also remove fluoride and other constituents, which we see no evidence that they can remove. However, the NLP™ filtration system seems extremely overpriced for what it is rated to remove, compared to other high performance systems that remove even more contaminants. Specifically, the NLP™ system is marketed at a “discount” price of $4200 and the social media postings indicate that replacement filters cost over $500 every 6 months. While we at FLINTWATERSTUDY never endorse specific water treatment products, systems are available on Amazon.com that have proven performance exceeding that of the NLP™ system for just $700 with replacement cartridges that cost only $110. Thus, the price markup for the NLP™ systems is 500-700% versus those actually rated to remove the constituents cited on social media. In other words, according to our analysis, FLINT RESIDENTS COULD BUY A SYSTEM AT 20% OF THE COST THAT WILL ACTUALLY REMOVE MORE. Does it really protect your water heater and private property from damage? Science is all about proving things and getting to the truth. 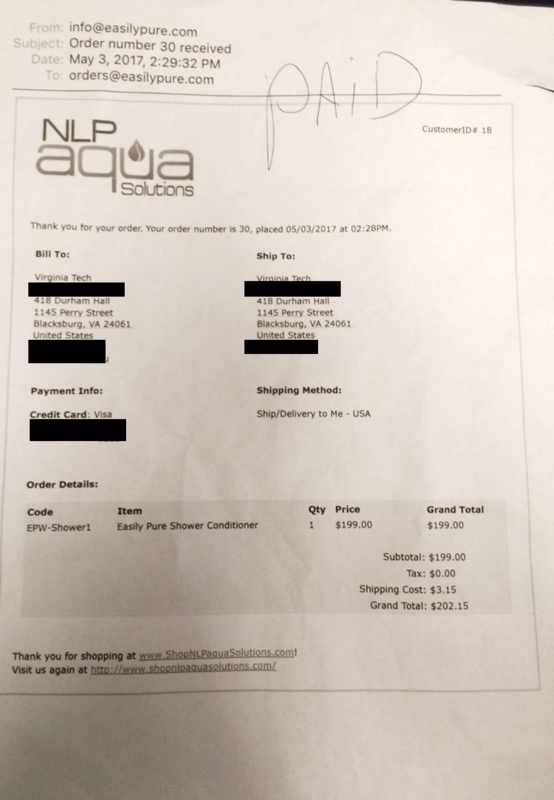 Because it is possible that this device supported by WATER DEFENSE actually re-writes basic laws of chemistry and physics, and our decades of experience in water treatment are wrong, we actually purchased an NLP™ conditioner to see if it worked as advertised. Our NLP™ device had a list price $279.00 but we got it on sale for “only” $199.00. 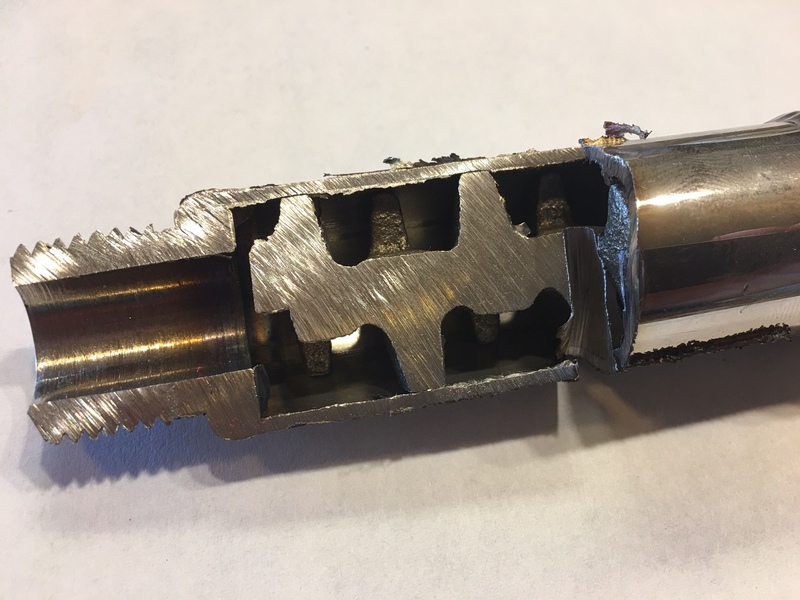 The device looks like a 10 cm piece of stainless steel pipe with some brass baffles inside it that should cost about $5 in materials. Four high profile and dubious claims about the device were tested including: 1) it produces “wetter water,” 2) the treated water produces more soap suds because of reduced surface tension, 3) it stops hardness scale from precipitating, and 4) it raises ORP. The results were inconclusive; in all likelihood, both waters are equally wet. Result: We assembled a small rig to pump Blacksburg Tap Water (flow rate = ~150 mL/s) through and tested two conditions – a control and one with the conditioner in the flow. Washing detergent is added to each bucket containing 5L water right before starting the experiment (same experiment as in the Australian Turbu-Flow video). The soapsuds are not changed by the conditioner, contrary to claims in the video. If anything, in our experiment, the control perhaps has somewhat more suds. We also measured the actual water surface tension by capillary rise method. Hard well water treated by the NLP conditioner was not significantly different from untreated well water. Another false claim. Result: We took synthetic hard water (197 mg/L as CaCO3) at 20 o C and pH 6.8 and pumped it through the NLP water conditioner and the water was then heated to 100 oC. The heated water was filtered through a 0.2 um filter to determine the [Ca2+] concentration that remained dissolved in the water. This concentration was subtracted from the initial concentration to determine the temporary hardness (amount of CaCO3 precipitated). The control experiment was pumped at the same flow rate but without the conditioner. This was done in duplicate. The results show that the NLP™ conditioner did not stop scale from forming. We then increased the temporary hardness of the test water to 292 mg/L and redid the experiment (see results below). The conditioner did nothing. Result: The ORP (measured using a HANNA HI 9828 meter) of “conditioned” tap water was actually the same as untreated water. If anything, it was slightly, but not significantly lower– the exact opposite of what was claimed. In summary, it seems the conditioner offers NONE of the purported benefits when put to scientific test. Now of course, we have not yet fed the water to cows and see if they produced 30% more milk, but we did what we could. Overall Verdict: Is This Criminal? Our problems with Mr. Smith’s improper sampling and false statements are well-documented, but in this particular case, we question not only the ethics of the proposed “package deal,” but also the legality of these activities. The false health claims are particularly worrisome– Mr. Smith’s (WATER DEFENSE and Aquaflex Holdings LLC) assertion to Flint residents that this is the only filter system he is aware of that produces water considered good enough for safe bathing in Flint, is just sickening. We have therefore referred this matter to the Attorney General. Attorney General sounds like the correct place for this. The question is: Are our Government agencies prepared to deal with such false claims in marketing associated with chronic environmental issues?